Zeke Nnaji, senior, rises up for a vicious one handed slam. The royals destroyed Cambridge to move on to the semi-finals. Apparently, Kellen Weibel (Cambridge-Isanti), senior, didn’t get the memo, no chance for an upset today. The Royals started and finished the game ahead. After winning the tip, Hopkins never looked back. The first three possessions saw the Royals show exactly what it was that made them great, stellar offense, followed by unmatched defense. Kerwin Walton, junior, drained a mid range to initiate the dominance. The very next possession, Dane Zimmer, senior, swats a layup off the glass and Walton goes down and sinks a great contested three point shot. Nine minutes into the first half, this game was already all but over, with a score of 28-9 it appeared that there was no way the Bluejackets were making a dent in the Royals state championship bid. Two easy steals from Andy Stafford, senior, led to some very simple fast break points. With steals coming from almost everywhere on the Royals roster, they were tied at half when it came to steals, 8-8. The Royals were not only performing fantastically on defense, but on the offensive side as well, with such a size advantage, Hopkins could basically do whatever it is they wanted on that end of the floor. The Royals shot an impressive 50 percent from the field, but fell short other than the two from Walton in the case of three pointers, shooting 22.2 percent. One major highlight from the first half for the Royals was after senior guard, Josh Fogel subbed into the game with just under seven minutes left, he went on to drain a wide open three point shot and celebrate in the best way possible, with the three point bow and arrow. The Royals did nothing but continue their dominance in the second half, after Henry Abraham, junior, opened up the first half with a three, the Bluejackets scored a total of 10 points through the eleventh minute of the second half. 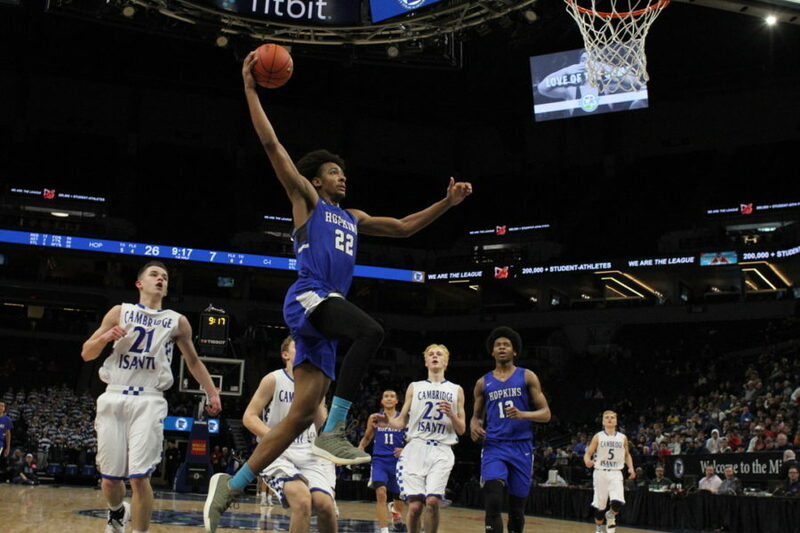 Zeke Nnaji, senior, had nothing but babies in the paint with him, being forced to foul, the Bluejackets gave up four and one opportunities to Nnaji. Converting on three and grabbing the offensive board on the fourth which led to a wide open mid range basket for Jalen Dearring, senior. Hopkins was facing a 2-3 zone defensive scheme, though their incredible ball movement was able to get past that with ease. Late in the second half, Fogel subbed back into the game and made some great passes to Zimmer for easy layups. With around three minutes left, a fan favorite, Sam Jonas, senior, subbed into the game was gifted a layup from another fantastic pass by Fogel. The Royals finished this match with lots of confidence going into their MSHSL state tournament semi final matchup. Hopkins defeated Cambridge-Isanti with a final score of 86-53, and will take on the winner of East Ridge vs Eastview on Mar. 21, at 8:00 pm at the Target Center.